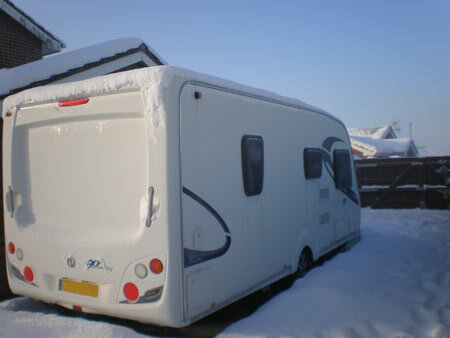 Do you need caravan insurance over winter when not in use? Whilst it may be tempting to try and save a little bit of money in the run up to Christmas by cancelling your touring caravan insurance, the saving just does not outweigh the risks. The fact is, caravans need to be insured all year round as claims can happen at any time. For example, our claims statistics show that 33% of caravan thefts happen over the winter months from December to March, showing how important it is to keep insurance cover in place. And whilst it’s true that road and accidental damage claims are unlikely to happen when a caravan is in storage, other risks such as theft, vandalism, fire, flood and storm damage can strike at any time. Plus some risks, such as winter weather damage from frozen or burst pipes, are much more likely to take place over winter when the vehicle is in storage – and it’s for this reason that it’s vitally important caravan owners keep their vehicles insured over winter. As part of preparing your caravan for winter storage we’d recommend that you have the vehicle serviced and cleaned before putting it away for winter. A clean, fully checked and serviced caravan or motorhome is much less likely to suffer problems over winter, particularly with things such as water ingress in the habitation area as a result of damaged seals – something which can be spotted and remedied at a pre-winter service. Caravan covers, providing they are the properly fitted breathable varieties, are also a good way to protect your ‘van over winter. It’s also important to make sure you have the right security fitted to your caravan and that it’s in full working order before your tourer is put into storage for the winter, making sure tracking device subscriptions are up-to-date and that there’s enough power to trigger these if needed and alarms. Caravan Guard offer discounts for the fitting of many security devices, visit our caravan security page to find out more. Also, make sure if you’d made any changes to things such as your security or storage, you move home or even change your caravan, then you need to be letting your insurance provider know to make sure you’re fully covered in the event of a claim. Nice post, we got caught out by it last year actually! horrible weather destroyed our brake discs.